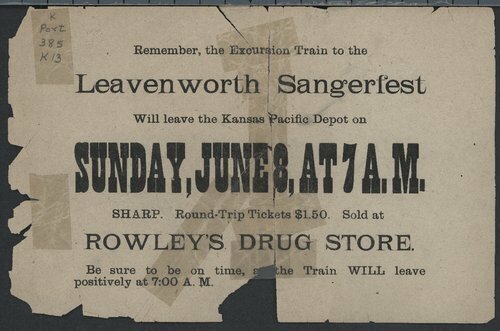 Handbills advertising a Kansas Pacific excursion train from an unknown location to Leavenworth, Kansas, for the Sangerfest, a musical festival. Round trip tickets are $1.50 for sale at Rowley's Drug Store. The train leaves at 7:00 a.m., Sunday, June 8th and you must be on time. Remember that the Sangerfest excursion train will leave the Kansas Pacific depot . . .